Since our last article on Cat® track type tractors there has been plenty of news and developments and an important new model release. Here, product specialist Peter Witte introduces the latest model to the medium duty range and discusses the available technology. Our last look at the Cat Medium track type tractor range was focused on the introduction of integrated Cat Grade technologies along with a new powertrain on the 161kW D6T model. “Now, we have taken the success of the D6T and its smarter, highly efficient new powertrain and released the new 264kW D8T,” Mr Witte said. The D8T builds on the success with a similar powertrain featuring a fully automated four-speed transmission with a lock up torque converter. 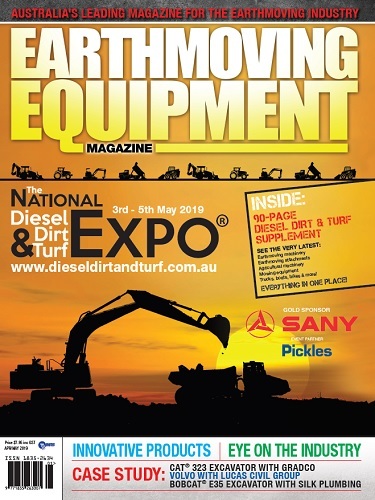 Importantly the new D8T model offers a major productivity advantage – boasting the largest semi-universal blade available in its class at 10.3 cubic metres – offering a 19 per cent increase in capacity. “When coupled with a 13 per cent increase in available engine power, operators could experience up to 15 per cent more material moved,” Mr Witte said. With expected production increases available through improvements on the D8T, operators can move more with little to no overall increase in operating costs,” he added. A closer exploration of the new D8T illustrates how operators and owners will stand to gain more while spending less. Firstly, the fully automatic four-speed transmission with lock up torque converter essentially provides an additional gear between the traditional first and second speeds seen in power shift transmissions. When matched to the exclusive Cat torque converter/divider and combined with a seamless lock-up clutch engagement, this means operators have the ability to shift up and down more smoothly and automatically. Here the four-speed transmission and torque converter works to continuously optimise the gear selection and engine speed for the task at hand without the need for further operator input. “The operator simply selects the ground speed and machine will do the rest,” Mr Witte said. Optimising the powertrain efficiency in this way delivers up to 13 per cent more drawbar power to the ground, improving fuel efficiency for the volume of work being completed. Secondly, the 10.3 cubic metre Semi- Universal blade with its 19 per cent increase in capacity can also be equipped with an optional performance cutting-edge system for even greater productivity. 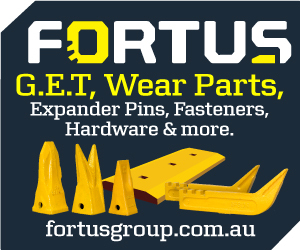 With this combination, operators can expect up to 25 per cent increase in blade loads in demanding ground conditions. The optional patented cutting-edge system is designed to better penetrate harder ground or moderate rock, by digging deeper, Mr Witte explained. 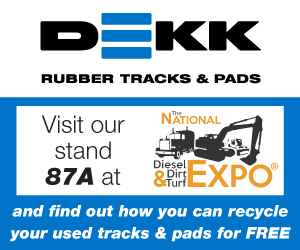 “This aids blade control, load retention, improves traction and results in reduced track slip. There is no expected additional wear life cycle costs when compared to standard cutting edge systems, he said. “Just better blade performance when demanded in harder conditions. “Moreover, with a 10 per cent increase in steering torque, manoeuvring the larger blade under load is achieved with ease.” Further reductions in operating costs are gained by use of cartridge-style filters and increased service intervals for engine oil changes. Combined, these measures contribute to the design objective of moving more and spending less. Cat Grade technology remains at the forefront of the machine’s efficiency and productivity. 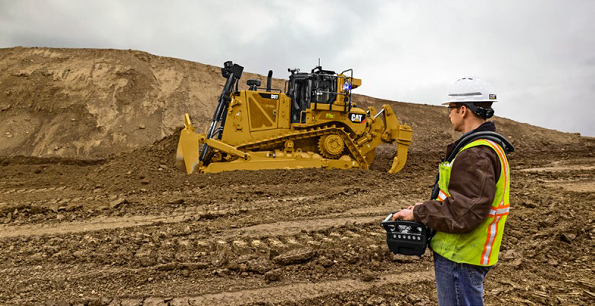 Available as an option on the D8T is Cat GRADE with Slope Assist™ – a system that requires no external transmitters or base station. Mr Witte said it was a relatively simple feature. An optional Auto-Ripper control includes a new ‘rip-to-depth’ feature that will automatically adjust the engine speed and ripper depth to reduce track slip. “The operator views the mainfall slope and blade cross slope on the monitoring display, sets their desired blade position and simply activates via a button on the control lever and Slope Assist will maintain that blade position.” “It is a great feature that allows simple jobs to be finished quicker with better surface quality and with less operator input required. And, that helps lower fatigue and improve productivity,” he added. The optional factory fitment Cat GRADE with 3D is a fully integrated system without the need for a typical GNSS blade mast mount antenna system and is for use with 3D designs. GRADE with 3D helps improve grading efficiency and accuracy by automating blade movement required in complex 3D designs with reduced operator input. Two GNSS Antennas are fitted to the top of the cabin (eliminating issues associated with blade mounted masts and cabling) while the receivers are located within the cab structure of the machine. If GNSS signals are limited, there is also an option of installing blade mounted mast receivers for laser systems or with a Universal Total Station to allow continued productivity. The range of improved specifications on the D8T is designed to enhance the user experience, reduce fatigue and improve productivity – particularly on repetitive tasks. Optional features include Auto Blade Assist that allows the operator to pre-set the load, carry and spread blade pitch positions. AutoCarry allows more consistent blade loads, and helps reduce track slip by automating the blade lift during the cycle. The system also works seamlessly with the integrated GRADE 3D option. An optional Auto-Ripper control includes a new ‘rip-to-depth’ feature that will automatically adjust the engine speed and ripper depth to reduce track slip. Integrated machine systems mean the D8T is ready for adoption of technology including ‘Command for Dozing’. “Command for Dozing allows the machine to be operated in various levels of remote control,” Mr Witte said. “This provides enhanced operator safety and continued productivity by using either a line of sight, or a remote operator station. 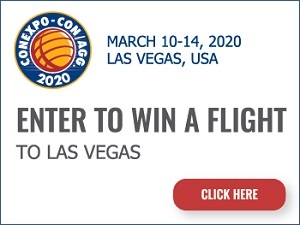 “Attendees at the last CONExpo in the US would be aware of the Cat display that had a D8T located at our Proving Grounds in Peoria and operated by a control station at the show in Las Vegas,” Mr Witte said. The operator maintains control of the dozer with less exposure to potential hazardous applications, or conditions, by utilising deep integration with the machine’s systems enabling smooth and precise control. Another option is a heavy-duty Extended Life Undercarriage with DuraLink that can improve operating costs in abrasive job-site conditions. Heavier bushings add up to 25 per cent more wear life and a patented crowned DuraLink™ is hardened to extend life and reduce scalloping to improve operator ride comfort. Other standard fitments now on the D8T include an electronic fluid level verification system that switches on at start-up to check coolant, engine and powertrain fluids while a programmable auto-reverse cooling fan engages to clear debris from the radiator package. The D8T track type and associated technology builds on the pedigree of a long line of Cat track types, particularly the recently released D6T, and is on track in delivering performance and productivity while lowering operating costs.